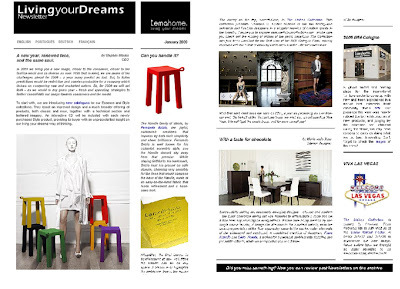 Since January 2009, we have upgraded the look and reach of our Living your Dreams newsletter. It will now include, besides English, translated versions in German, Portuguese, French and - from February - Spanish. If you haven't done so yet, please subscribe to our newsletter on the textbox found on the right of this blog, or alternatively visit www.temahome.com and enter your email address at the bottom of the page. Stay tuned to exclusive insights from our designers, a word from our CEO, special offers, upcoming events and more! Change is really coming to America!! !